The Sony Xperia Z2 comes six months after the Xperia Z1 to displace it from the top of the Sony foodchain by means of a better chipset, bigger display and a bigger 3,200 mAh battery. The increase of just 200 mAh doesn’t sound like much when factoring in the 0.2″ bigger display and faster hardware but may turn out important in the end. We’re going to look at the Sony Xperia Z2 numbers and compare them with those posted by the Xperia Z1 to see the difference. The Sony Xperia Z2 managed to post a very impressive 22 hours and 3 minutes which easily clears it a spot in the top 20 of all phones tested. The direct rival Samsung Galaxy S5 managed just an hour less while the HTC One (M8) got 2 hours less. The Sony Xperia Z1 predecessor and the LG G2 on the other hand did notably better in the test, beating the Xperia Z2 by over three hours. All of the scores are impressive on their own, though. 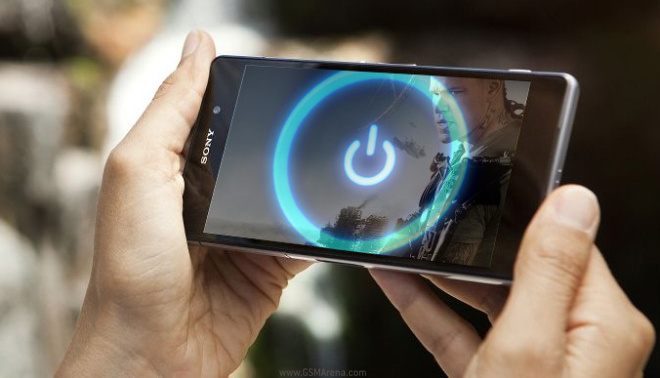 The web browsing test saw another great performance from the Xperia Z2. Sony has obviously resolved whatever issues the Xperia Z1 had with the Xperia Z2 as the new flagship lasted for 11:32 h – almost twice as much as its predecessor. The Sony Xperia Z2 also managed to outdo the Samsung Galaxy S5 and HTC One (M8) by two whole hours. The LG G2 stayed very close, though, lasting just around 10 minutes less. Many will be looking at the Sony Xperia Z2 because of its improved, bigger display and you can bet one reason for this will be watching videos. The Xperia Z2 wasn’t a disappointment in this regard either and posted a 12:16 h score. Again almost twice as much as it’s predecessor and a whole hour more than the Samsung Galaxy S5 and HTC One (M8). The LG G2 is very close with 11:51 hours of video playback. 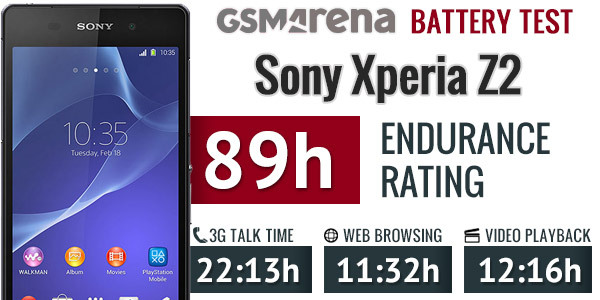 Coupled with an impressive stand by time the Sony Xperia Z2 was able to achieve an 89 hour endurance rating. It represents the interval between charges if you do 1 hour of each activity (video, calling and browsing) per day. That’s a very impressive score for the Xperia Z2 and easily among the best we’ve seen. If you want to learn more about the smartphone, you should refer to our Sony Xperia Z2 review. You can also check out our Battery Test page where you can sort battery performance by endurance rating, talk time, web browsing or video playback. You can also customize the usage pattern to get an endurance rating better suited to you.